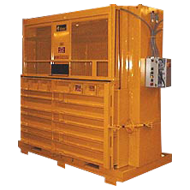 The Most Efficient Vertical Large Baler for Large Corrugated Available Today. The V-8448 HD is designed for facilities generating significant numbers of cartons or sheets of scrap corrugated too large to bale in a standard vertical baler without breaking down or folding the scrap before feeding it into the baler. Automobile assembly lines, distibution center and furniture manufacturing plants often have this problem. 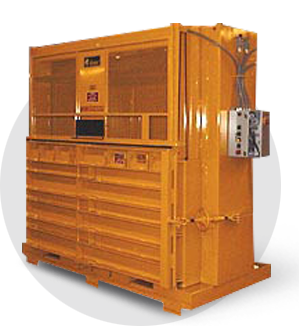 Horizontal balers large enough to bale this scrap efficiently require large areas for operation, and the scrap must be collected and transported to the central baler. The V-8448 HD allows scrap to be baled at the point where it is produced, thus reducing material handling labor, and the relatively low cost of the V-8448 HD makes it practical to install multiple machines if necessary. • Bale weights of 1,700 pounds, 84" x 48" x 48"